Parasec :: The Source: The Alert is out! If you notice any changes in the writing style in this latest issue of the Alert, it’s because my assistant, Erin Sierchio, took on the job for me. After years of writing our newsletter with little assistance and only one short break, I’ve finally found the perfect person to tackle this major task. Erin has a degree in English and has been with Parasec now for over a year. During her time with us, she has educated herself about what we do and she is now able to handle the vast majority of the writing requirements. I will still be actively involved in writing my column as well as in editing and assisting on any articles where Erin is uncomfortable with her knowledge of the subject. I’m looking forward to spending some of my newly freed time developing new and informative continuing legal education seminars, and getting those seminars onto the internet as Webinars, which will allow our clients to access the information more readily. 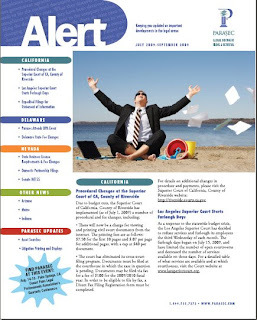 The Alert will continue to maintain its high standards for providing current and relevant information and we look forward to any input you may have that will help us to continue to improve on our format and presentation.